Core vaccines — are those that are required because the diseases they protect against are fatal, highly contagious, or can be transmitted to humans. At our facility, these include rabies, distemper (DHPP), and leptospirosis for dogs, and the combination respiratory and gastrointestinal viral vaccine (FVRCP) for cats. Rabies is one of the most serious diseases your pet is likely to encounter, as it is always fatal in a pet that has not been vaccinated for it because there is no cure. Since keeping your pet up-to-date on the rabies vaccine is it’s only protection and because rabies is classified as a zoonotic disease — meaning it can be transmitted to humans — all dogs and cats are required by law to be current on the rabies vaccination. 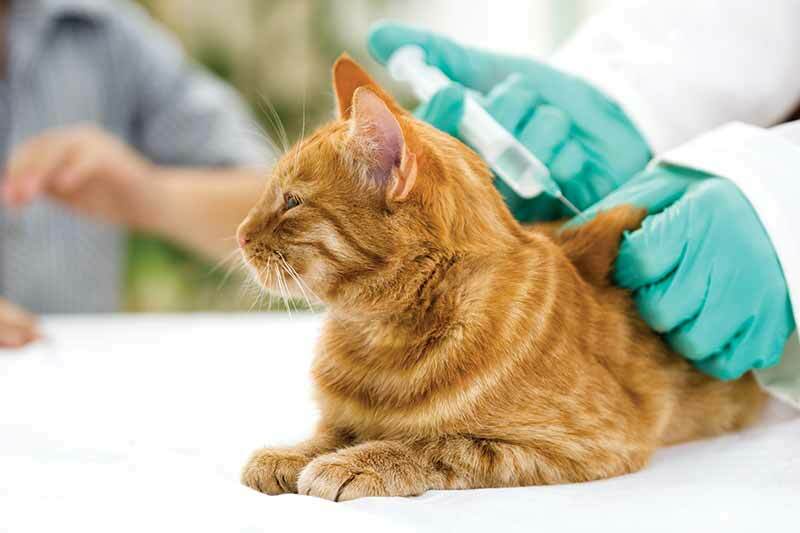 Besides rabies, there are other immunizations that may be considered core vaccines for pets, but these can vary and will usually be specific to the geographic region the pet lives in. Non-core vaccines — are those that are not required, but are recommended or required only for certain purposes, such as boarding, grooming or obedience training. At our facility, these include bordetella and canine flu for dogs, and feline leukemia for cats. These vaccines help protect against illness that are contagious and commonly spread in places where pets of the same species congregate. We may recommend additional vaccinations based on your pet’s lifestyle and environment, as well as where your pet travels. The Lyme disease vaccine and rattlesnake vaccine for dogs fall into this category. When it comes to infectious diseases, you don’t want to take any chances. Many vaccines can (and should) be administered as early as 6 weeks of age. Puppies receive boosters every 3 to 4 weeks until 16 weeks of age, which is the point when there is no longer any maternal antibody interference from the mother. We understand that some pet owners are concerned about over-vaccinating their pets, which is why we recommend regular wellness exams so we can administer only the vaccines your pet needs, when they need it. If you haven’t already downloaded the Lone Tree Vet App, now is the perfect time! Our free app gives you access to your pet’s vaccination information, allows you to request appointments, and provides reminders for parasite protection, upcoming appointments, and much more. For more information about pet vaccinations, please don’t hesitate to contact the team at Lone Tree Veterinary Medical Center. We’re always here for you and your pet!